In this groundbreaking book, David H. Rosen, M.D., offers depressed individuals, their families, and therapists a lifesaving course in healing the soul through creativity. 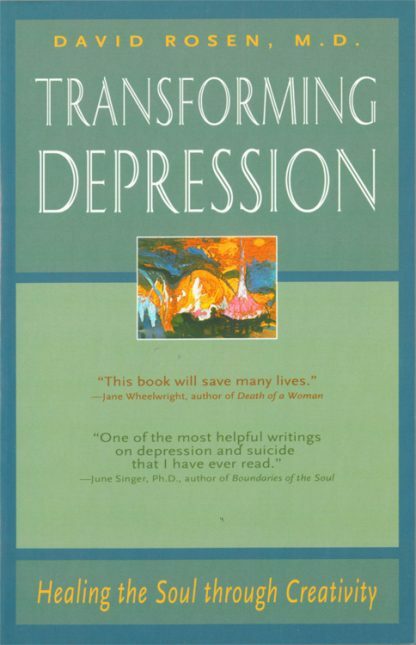 This is a book about transforming depression and its powerful pull toward suicide into a meaningful alternative.In Transforming Depression, Dr. Rosen applies Carl Jung's method of active imagination to treating depressed and suicidal individuals. Having dealt with depression in his own life and the suicides of loved ones, Dr. Rosen shows that when people learn to confront the rich images and symbols that emerge from their struggles, they can turn their despair into a fountain of creative energy. He details the paths of four patients whose work in painting, pottery, and dance -- in conjunction with psychotherapy -- led them from depression to a more meaningful life. Their dramatic paintings illustrate the text. Part One presents an overview of the biological, psychological, sociological, and spiritual factors involved in the diagnosis of depression. Part Two provides a new therapeutic approach to treating depression, focusing on the symbolic death and rebirth of the ego (ego-cide) as an alternative to suicide. Part Three presents in-depth case studies from Dr. Rosen's practice. Part Four discusses how we can recognize crisis points and how creativity can transform depression. The author pays particular attention to the problem of teen suicide. David H. Rosen, MD, is a psychiatrist and Jungian analyst who holds the only American full professorship in Jungian psychology, at Texas A & M University, where he is also Professor of Humanities in Medicine. He is the author of four other books, including The Tao of Jung: The Way of Integrity. He lives in Texas.